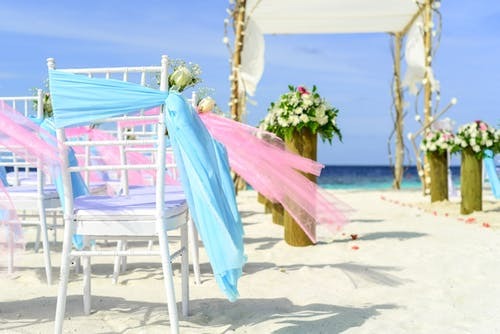 Many people are opting for a beach wedding as opposed to the traditional wedding because it’s cheap and eliminates the stress associated with planning for a traditional wedding. However, choosing the appropriate bridal gown for a beach wedding is not easy. Luckily, we share valuable beach wedding dress ideas that can bring sparkle and glamor to your beach wedding. Long beach wedding dress looks solemn and luxurious. The cut of this outfit can be straight or flared. In the first case, the decoration, as a rule, is complemented by a high slit, thanks to which a woman can move without discomfort. Meanwhile, the skirt in such outfits should be light and flying, the abundance of cascading shuttlecocks and heavy decor should be avoided. A lightweight wedding dress for the beach can resemble a tunic that provides maximum comfort in hot weather. Although this outfit may look rustic, it is perfect for a wedding ceremony on the ocean and blends beautifully with elegant sandals on a flat sole. In a situation where the choice of the bride falls on the beach wedding dresses, tunics, the groom should pay attention to the classic shirt and comfortable shorts made of organic cotton or denim. An overly luxurious beach wedding dress doesn’t fit because it looks out of place and doesn’t fit in with the festive atmosphere at all. Meanwhile, in this situation, the young lady will look great in a full skirt, which, moreover, can be supplemented with a train. This detail gives along special zest and sophistication so that the young bride looks like a real princess. Ivory flower girl dresses can also add charm and glamor to your wedding. A lightweight wedding dress for the beach can be as open as possible, but not so vulgar. In such a dress, a young bride will feel great even in the hottest weather. Meanwhile, even in such a setting, one should not prefer a design in which intimate parts of the body are visible. Thus, it should be borne in mind that if a young lady chooses beach wedding dresses with an open back, they should not be complemented by an overly deep neckline, and models with open shoulders should be of sufficient length and at least cover the buttocks and hips. A great choice would be a summer wedding dress for the beach, made of airy materials. It can be flying chiffon, elegant and sophisticated lace, exquisite and noble organza, or elegant silk. All these fabrics freely flow through the body, providing its owner with maximum comfort, without sticking and pulling the bride to the ground. In such a dress, you can easily be at ease the whole day, even in the evening not experiencing fatigue. White flower girl dresses with an appropriate color accent will compliment your bridal gown. In a situation where a wedding is planned on the beach, the dress can be almost anything. A ceremony on the shore of the reservoir is not a wedding in a church, where choosing a dress needs to take into account many important nuances. Here, on the contrary, deep cuts, high cuts, asymmetry and much more are welcome - everything that can make an image bright, exciting and expressive. Ladies choose beach-style wedding dresses with original decor, able to distinguish them from the crowd. Thus, such models can be decorated with feathers and fur inserts, transparent elements located in different areas of the body, ruffles, frill, and other bright details.